We invite you to bring your favorite music and video selections when auditioning our products. We are currently featuring Denon electronics, including the new AVP-A1HDCI Pre-Amp, POA1HDCI Multi Channel Amp and the 3800 BlueRay Disc player. Current speakers are from Atlantic Technology, the 8200e 7.1 surround sound system. 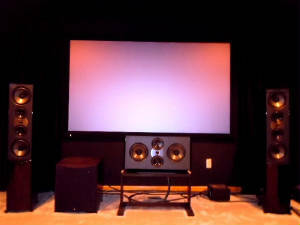 Video sources are being shown on the new PLANAR 8150 1080P front projector on a SI Black Diamond 16X9 Screen. All components are connected with Harmonic Technology cabling and are line conditioned with components from the Richard Gray Power Company. 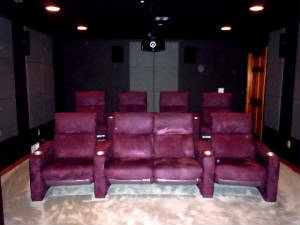 Sit back and enjoy the show in theater seating from Cinematech.